Dr. Cherry, who is board-certified in internal medicine, hematology and medical oncology, joins Atlantic Health System Cancer Care from the University of Oklahoma Health Sciences Center’s Stephenson Cancer Center. While at the University of Oklahoma, he held a number of senior appointments, conducted pioneering research on leukemia and lymphoma drugs and investigated whether epigenetics – the study of inheritable changes to our cells that go beyond DNA mutations -- can be used to help track the effectiveness of chemotherapy in osteosarcoma, a type of bone cancer. The leaders of Atlantic Health System have a strong commitment to innovation, clinical research and patient-centered care, and to bringing the latest FDA-approved treatments to cancer patients. 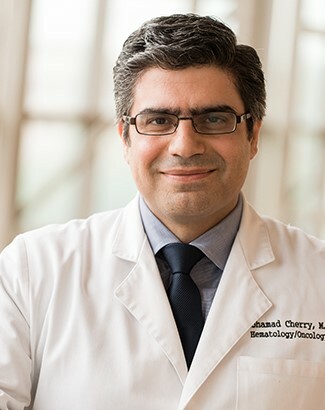 Award-winning physician-researcher Mohamad Cherry, MD, has joined Atlantic Hematology Oncology, part of Atlantic Health System’s Atlantic Medical Group at the Carol G. Simon Cancer Center. Dr. Cherry, who is board-certified in internal medicine, hematology and medical oncology, joins Atlantic Health System Cancer Care from the University of Oklahoma Health Sciences Center’s Stephenson Cancer Center. While at the University of Oklahoma, he held a number of senior appointments, conducted pioneering research on leukemia and lymphoma drugs and investigated whether epigenetics – the study of inheritable changes to our cells that go beyond DNA mutations -- can be used to help track the effectiveness of chemotherapy in osteosarcoma, a type of bone cancer. With specialty training from some of the nation’s leading medical educators and researchers, Dr. Cherry completed a rotating fellowship in the leukemia department at MD Anderson Cancer Center and a fellowship in hematology/oncology at the Oklahoma University Health Sciences Center Stephenson Cancer Center, where he was elected chief fellow of the Section of Hematology and Oncology. He completed two residencies – an internal medicine residency at Staten Island University Hospital and a laboratory medicine residency at the American University of Beirut Medical Center in Lebanon. Dr. Cherry earned his medical degree from Lebanese University, where he was third in his class, and performed his internship at Sacre Coeur Hospital-Lebanese University. Dr. Cherry also received a Master’s of Science degree in clinical and translational research from Oklahoma University College of Public Health.